Venus is the “bright star” in the eastern predawn sky during June 2017. 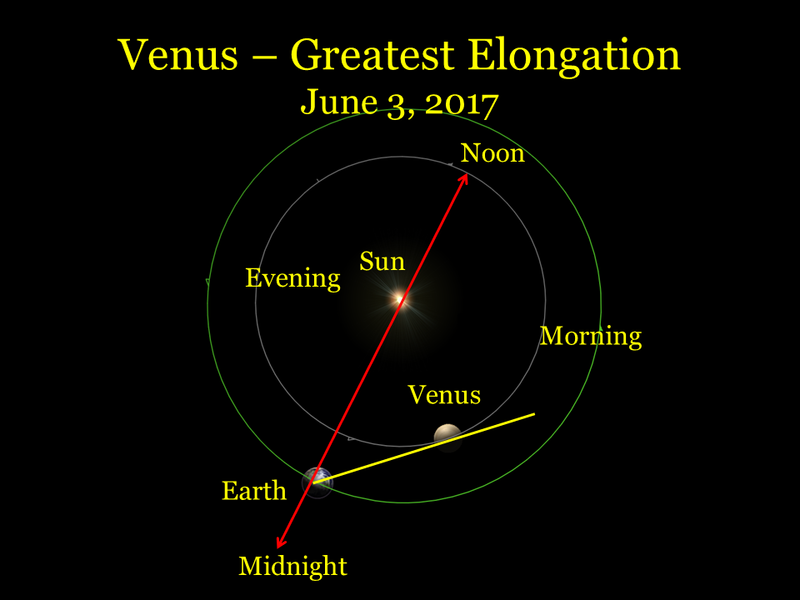 On June 3, Venus reaches its greatest angular separation from the sun, rising about 2 hours before sunrise. During its appearance so far, Venus has been rising during morning twilight. On June 10, this bright planet begins rising before morning twilight starts. By month’s end, it rises over 2 hours, 30 minutes before the sun and over twenty minutes before the beginning of morning twilight. On the mornings of June 20 and June 21, the waning crescent moon appears near Venus. On June 20, the moon is nearly 7.5 degrees to the upper right of Venus. On the next morning our lunar neighbor is about the same angular distance to the lower left of Venus. Update: Here’s the view this morning, June 20. Update 2: Here’s the view this morning, June 21.